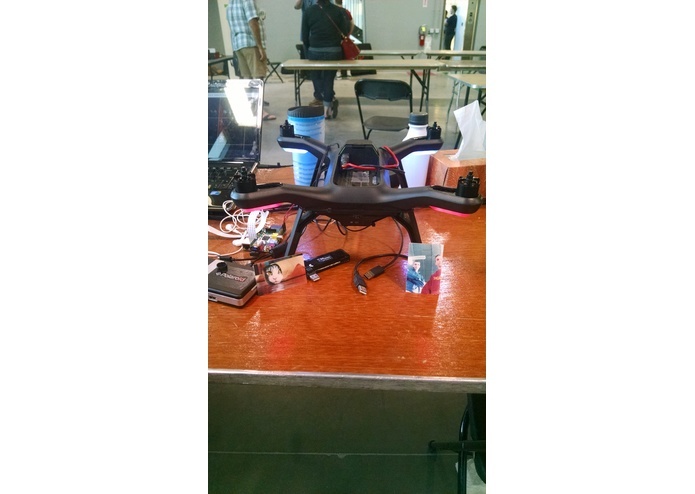 A drone service, once provided your location via web app will fly to you, take a photo, and drop a Polaroid print. Blending the old and the new. Uniting the nostalgia and fun of a Polaroid picture, with the modern drone age. Dronie is a photo taking service, that will use a provided destination specified via web app to fly to a location of your choice. Once at the destination, the drone will snap a photo, print the Polaroid, and drop it before heading home. Dronie is the culmination of numerous systems acting as one. Starting with the location given to Dronie from the user, the web app then relays the information to the raspberry-pi attached to the drone which plots the course. The drone itself is running an auto-pilot, which we leverage to maintain stability and safety throughout the flight. Once at the destination, the raspberry-pi's attached camera captures a photo, and relays the image to the Polaroid printer over Bluetooth. The print takes roughly 60 seconds, after which the photo falls to the ground where it can be recovered by the user. The raspberry-pi then follows the same flight path back to home. With a multitude of separate systems, communication is not always easy. Our biggest challenges came from trying to get all of our devices to speak the same language. We our proud that we successfully solved the communication issues discussed previously, and that we have a fully functioning, if not crude product. Since we are not only teammates but also roommates, we see ourselves continuing work on Dronie in the future.